The New York Rangers won’t be making it to the playoffs this season, so there won’t be enough time for Jesper Fast to return from injury. Head coach David Quinn told reporters today that Fast will miss the rest of the year, while Marc Staal and Chris Kreider will miss tonight’s game as well. Fast, 27, will end this season with just 20 points in 66 games, a disappointing year for a player who had reached new highs in 2017-18. The two-way forward is still an effective option for the Rangers, but hasn’t shown much upside and will be an interesting player to watch this summer. Heading into the final season of his current contract and carrying a $1.85MM cap hit, he could be another player on the move as the Rangers continue their rebuild. That said, he has long been regarded as one of the hardest working players on the team and is routinely praised by teammates and the coaching staff, even winning New York’s “Players’ Player” award for the last four years. With so much turnover on the roster of late, perhaps the team will want to keep Fast around on another multi-year contract to help guide the young core. With offensive players coming through the pipeline, his defense and versatility can still be quite useful. Meanwhile, the Rangers have gone on a 2-5-3 run over their last ten games and are now sitting in 27th place in the NHL. It seems unlikely they’ll fall any lower than that and improve their draft lottery chances, but any success could see them skyrocket up the standings. They take on the Pittsburgh Penguins tonight. No one really knows what the plans are of general manager Jeff Gorton and the New York Rangers. The team could continue quietly rebuilding this summer or accelerate that process and bring in a big-name free-agent or two. Regardless, many of the team’s decisions will depend on what their overall plans are. That will certainly be the case in how the Rangers intend to deal restricted free agent Pavel Buchnevich. While the 23-year-old hasn’t been as impressive this season as last point-wise, Buchnevich has scored a career-high 18 goals and with his entry-level contract ending, is in line for a significant raise. With quality restricted free agents getting more and more money on their next contracts, Buchnevich could be an interesting case. The Athletic’s Shayna Goldman (subscription required) writes that much will have to do with the Rangers’ plans. If the team intends to make a significant splash in free agency, going after an Artemi Panarin-type of player, the team might be better served locking him up to a long-term extension to keep his salary down. However, if the team intends to quietly go one more year into its rebuild, then the team would have ample cap room to sign him to a shorter-term contract until they know what they have in him. The Rangers announced that forward Chris Kreider will be out Monday and remains day-to-day with a lower-body injury. He has been out since Tuesday. 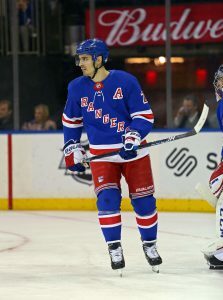 Kreider has been a key asset to the team’s offense as he has 26 goals this season. The Boston Bruins received some good news as the Boston Globe’s Matt Porter reports that Marcus Johansson, who has been out of the lineup since Mar. 5 with a lung contusion after colliding with Carolina’s Micheal Ferland, is back on the ice. He is in a gold non-contact sweater, suggesting that he hasn’t been cleared for contact. The 28-year-old was acquired by the Bruins in a trade deadline acquisition, but has appeared in just four games for Boston, registering only an assist. Porter also notes that Torey Krug is also wearing a non-contact jersey at practice today. Krug has been out since Mar. 12 with a concussion. The Toronto Maple Leafs caught a break after John Tavares took a tough cross-check from the New York Rangers’ Marc Staal, as the star center was at practice today, according to TSN’s Kristen Shilton. The Maple Leafs have lost five of their last seven after falling in overtime to the struggling Rangers. Despite the vast improvements made by the St. Louis Blues this off-season, the common perception is that their fate still lies in the hands of goaltender Jake Allen. Last season, in the first of a new four-year, $17.4MM contract, Allen took a major step back. The 27-year-old had been a great success as a part-time goalie early in his career and looked like he was ready for full-time duty after the 2016-17 campaign, but was unable to handle the workload. Allen’s appearances actually dropped last season from 61 to 59 as backup Carter Hutton took over the starter’s job with consistent and impressive play. Allen posted a .906 save percentage and career-worst 2.75 GAA and failed to record a plus quality starts percentage. That has to change next season. As The Hockey News’ Jared Clinton writes, Allen is the key to St. Louis’ success (or failure) in 2018-19. With Hutton gone, replaced with journeyman Chad Johnson, the pressure is back on Allen to be the legitimate starter that he has shown flashes of. The Blues should be applauded for re-hauling their forward core this off-season, somehow managing to add Ryan O’Reilly, David Perron, Tyler Bozak, and Patrick Maroon without going over the salary cap. The team also continues to sport one of the deeper blue line’s in the league. However, they need consistent capable play out of Allen or it could be all for not. St. Louis has a contender’s roster if only they can get Allen back on track. Dallas Stars super-prospect Miro Heiskanen is all-in on making the team this season. The 19-year-old is just one year removed from being selected third overall in the NHL Draft and is ready to show that he was worth the selection. Stars beat writer Mark Stepenski reports that Heiskanen has already arrived in Dallas and has begun working out with teammates, including veteran leaders Jamie Benn and Ben Bishop. The young defenseman has worked hard this summer and is preparing to wow the Stars’ coaches and executives in training camp. For their part, the Stars’ decision-makers already believe that Heiskanen is ready, although they caution that there will be some adjustments to make and that expectations may be getting too high. Some have even stated that Heiskanen is a legitimate threat to No. 1 overall pick Rasmus Dahlin of the Buffalo Sabres in the upcoming Calder Trophy race. They might not be too far off; like Dahlin, Heiskanen has two years of pro experience already, in the Finnish Liiga, and possess both elite skating ability and next-level awareness and positioning. With those skills already at a pro level, it might not be too difficult of a transition for Heiskanen after all. Frequent alternates Marc Staal or Jesper Fast could emerge as favorites, but neither jumps out as a spectacular candidate for captain. Long-time forward Mats Zuccarello also wore the “A” often, but one has to wonder if it would be worth giving the “C” to a player on an expiring contract who seems unlikely to earn an extension. The same could be said for top center Kevin Hayes. While it is uncommon, Quinn could lean towards awarding the captaincy to star goaltender Henrik Lundqvist, who Rosen writes he has already gotten to know very well. Young defenseman Brady Skjei, fresh off of a six-year extension this summer, appears to be the cornerstone of the Rangers’ rebuild and could emerge as a top candidate. As Quinn says, only time will tell. Poll: Who Is The Most Likely To Be Bought Out? The NHL buyout period opens later this month, and teams will have to make tough decisions on some of their overpaid former-stars. Rory Boylen of Sportsnet has been all over potential buyout candidates throughout the season, and has now released his list of the top eight names that could see a paycheck start coming to not play for their current teams. Last year we saw Simon Despres, Matt Greene, Antti Niemi, Benoit Pouliot, Jussi Jokinen, Lance Bouma, Ryan Murphy, Jimmy Hayes, Mark Stuart, Mike Cammalleri, and Devante Smith-Pelly bought out in the first window, and a similar number of players could find themselves on unconditional waivers this time around. We’ve already heard about Matt Moulson’s expected buy out from the Buffalo Sabres, but Boylen throws eight different names into the mix. Several of them were once key parts of their franchise, while others never turned into the player they were expected to become. Who do you think is the most likely player to be bought out when the window opens on the later of 48 hours after the Stanley Cup Final, or June 15th. Cast your vote below and make sure to leave an explanation in the comment section. For more information on how much each team would have to pay, check out Boylen’s excellent breakdown or head over to CapFriendly’s handy calculator. The New York Rangers still have to hire a coach, but the team’s top goal is to continue to improve its blueline this offseason. Just a year ago, the Rangers invested heavily into a veteran defense that was expected to be among the best in the league. The team went out and signed highly coveted free agent Kevin Shattenkirk and re-signed Brendan Smith to go with captain Ryan McDonagh and Marc Staal and a rising Brady Skjei. Instead the defense struggled mightily as they were ranked fourth in goals against, allowing 3.21 goals per game during the 2017-18 season. Now with McDonagh gone and the team in a rebuild, the Rangers must make more changes to improve their struggling blueline. The Athletic’s Shayna Goldman (subscription required) writes that a few pieces are certain. A healthy Shattenkirk should boost the team’s defense after the team shut him down in the middle of the year with a torn meniscus. Throw in a much improved year for Staal and the Rangers have a couple of solid pieces to aid them. The team still has high hopes for Skjei, despite his second-year struggles, but Smith is a complete unknown as it will be up to him to get into game shape and prove he was worth the four-year, $17.4MM deal he signed last offseason. The team did like the way rookie Neal Pionk played in his 28-game trial at the end of the year. Even defenseman Anthony DeAngelo showed improvement at the end of the year as well. The team also added a number of new young d-men at the trade deadline that aren’t too far off, including Ryan Lindgren, Libor Hajek and Yegor Rykov. Regardless, the team could use a boost from an experienced young defenseman that can help stabilize last year’s crew or at the very least, more young talent that will be ready within a year. The New York Post’s Larry Brooks writes that the team should consider offering up either Kevin Hayes or Mike Zibanejad in exchange for defensive help, assuming the player they get back is a current or future top-four defenseman. While he believes that Dougie Hamilton would be the perfect trade target, he doubts the Calgary Flames would move him. However, Calgary is loaded with defensive prospects that are stuck behind their veteran defense, suggesting the Rangers go after prospect Adam Fox, who is a top defenseman at Harvard University, and who was the former partner of Lindgren. Trading one of those young veterans could work as centermen are in high demand right now with few available on the free agent market and with the Rangers putting much of their hopes on both of last year’s first-round picks in Lias Andersson and Filip Chytil at center next season. No matter what, the team will have to make some changes if they hope to improve on their disappointing 2017-18 season. While Tampa Bay is believed to be the front-runner for Red Wings defenseman Mike Green, they aren’t the only team in the Atlantic interested in his services. MLive’s Ansar Khan reports that the Maple Leafs have also shown an interest in bringing in the pending unrestricted free agent. Toronto’s interest in adding some help on the back end is well-known but Green isn’t the typical defensive-minded blueliner that many have expected the Leafs to covet. As a result of their recent trades, Toronto has quietly freed up enough cap space to absorb Green’s full $6MM contract without needing Detroit to retain which could give them a leg up on more cap-strapped squads. As Pittsburgh’s well-publicized center search continues, BSN Denver’s Adrian Dater reports (Twitter link) that the Penguins have some interest in Avalanche pivot Carl Soderberg as a fallback option if they can’t land a more prominent target. Soderberg has had a bit of a bounce-back season with 24 points (11-13-24) in 56 games after recording just 14 in 80 contests last season. However, he has two years remaining on his contract after this one with a $4.75MM cap hit, someone that Colorado would likely have to retain on to facilitate a move. The Devils are getting closer to getting a key part of their team back in the lineup. Goaltender Cory Schneider participated in practice once again today and NHL.com’s Mike Morreale notes that he could return as soon as next week. Keith Kinkaid has seen the lion’s share of the workload since Schneider was injured January 23rd and has struggled at times with the extra responsibility. Once he gets the green light to return, veteran Eddie Lack will likely be returned to the minors. Rangers blueliner Marc Staal will return to the lineup on Thursday for the first time since suffering a neck injury on February 3rd, the team announced (Twitter link). New York is currently carrying the minimum roster of 20 players so they will not need to make any moves to officially activate him off IR. The New York Rangers will be without their backup goaltender Ondrej Pavelec, who sprained his MCL and will be out for two to three weeks, according to Justin Tasch of the Daily News. The injury happened during Friday’s game against the Calgary Flames when the 30-year-old goaltender was forced to leave during the first period of the game. The injury is just another one of many for the Rangers, who have been decimated by them. The team already is without winger Chris Kreider (rib resection), defenseman Kevin Shattenkirk (meniscus surgery), Pavel Buchnevich (concussion), Marc Staal (cervical strain). Defenseman Ryan McDonagh is also out with an upper-body injury. Winger Jimmy Vesey has also missed some time, but is expected to play today. Pavelec has struggled at times with the Rangers as he has a 3.01 GAA in 16 appearances and a .910 save percentage. He did, however, have a dominant streak between Oct. 26 and Jan. 7 in which he had a 2.27 GAA and a .937 save percentage. The recalled Alexander Georgiev from the Hartford Wolf Pack of the AHL Saturday. The 22-year-old has been hot recently there with an 8-0-1 record and a 1.76 GAA in his last nine starts. After clearing waivers, the New York Rangers have officially assigned Brendan Smith to the Hartford Wolf Pack of the AHL. Despite already recalling Neal Pionk yesterday to fill the roster spot, the team has also recalled defenseman John Gilmour. Though they don’t actually have Marc Staal listed on injured reserve as of this writing, that move is expected to create room for Gilmour, as he hasn’t played since February 3rd and is dealing with a neck injury. Gilmour, 24, is a speed demon on defense that recently won the AHL All-Star Fastest Skater competition. He has 26 points in 44 games this season, his second year in the AHL after signing out of Providence College. Originally a Calgary Flames seventh-round draft pick, Gilmour completed all four years at Providence and then waited to reach free agency in the summer of 2016. The Rangers told their fans yesterday that they’d be going after youth and speed, something that Gilmour certainly provides. While he is unproven at the NHL level, the team is looking to see what they have before making any further decisions in the offseason. Giving Gilmour and Pionk a chance down the stretch can’t hurt their development, and will give the Rangers an idea of where they stand going forward.